MONASH U. (AUS) — Researchers have shown the potential of a new kind of nanomaterial to filter out environmental poisons from water. 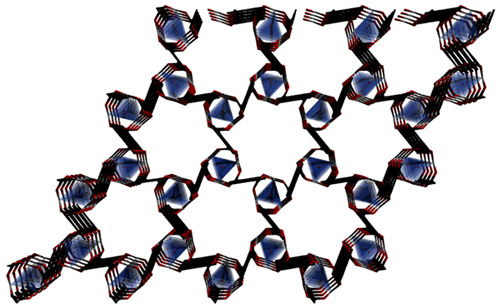 The uniform structure of highly porous metal organic frameworks (MOFs) makes them very efficient filters, says Mainak Majumder of the mechanical engineering department at Monash University. MOFs are clusters of metal atoms connected by organic molecules and known for their exceptional abilities to store or separate gases such as carbon dioxide. This is one of the first studies to demonstrate their separation applications in an aqueous environment. Majumder and colleagues demonstrated the filtering ability of the new MOF by sieving paraquat—a herbicide that has been linked to the onset of Parkinson’s disease. The MOF removed the paraquat, but left other contaminants. The findings are published in the journal Chemistry of Materials and were highlighted in Science. “Because MOFs are flexible, we found that their structure changed when they absorbed the paraquat. This means that our MOF could form the basis of a device for quickly and easily testing for the contaminant in water,” says Matthew Hill, from the Commonwealth Scientific and Industrial Research Organization. Paraquat was the only contaminant tested, but the researchers say the MOF could be altered to filter out others.